Much of the Apple Store's success has been built upon its staff. Apple Stores are one of Steve Jobs' greatest legacies, but the retail business has been a headache for Apple lately. The latest migraine: The friendly, t-shirt wearing retail workers helping you pick out your latest iPhone filed a class-action lawsuit late last month, suing the tech giant over unpaid wages. Two former workers claim that they were required to wait in line for a manager to check their bags for stolen goods before leaving the store -- but after clocking out. Some days the wait was longer than five or ten minutes, which added up to $1,500 in unpaid wages per year for one worker, according to the lawsuit. Apple (AAPL) Store employees typically make between $12 and $18 per hour. That's small change for a company that has brought in more than $79 billion in sales so far this year. The lawsuit could damage Apple's sterling reputation, said Robert Passikoff, president of brand research consultancy Brand Keys. "It begins to raise questions. And you don't want a question mark next to your brand," said Passikoff. "That jars people." But Apple has been down this road before. A year ago this week, Apple began laying off recent Apple Store hires to make its retail operation leaner. The problem: Apple has been praised for its ubiquitous help, and the cuts were made smack in the middle of the busy back-to-school season. Apple later reversed course and publicly admitted the layoffs were a "mistake." The company fired John Browett, its retail chief, two months later. Sales at Apple Stores have also begun to sink, and visits are down. This past quarter, Apple Stores averaged 16,000 visitors per store each week, down from 17,000 during the same period a year earlier. That's not a shock, considering Apple released a new iPad in March 2012 -- and hasn't updated it since. But here's a worrisome number: Per-store revenue fell 9% year-over-year, while Apple's overall sales were up 1%. Meanwhile, AT&T (T), Microsoft (MSFT) and many others have attempted to replicate Apple's retail model. Though they've had varying degrees of success, the seamless shopping experience is no longer unique to Apple. 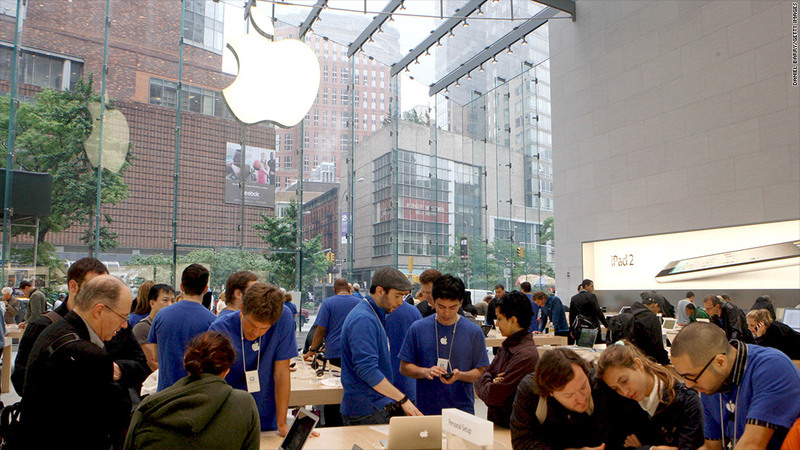 The Apple Store's success isn't something the company wants to mess with. Apple Stores are by far the most valuable retail spaces in the world measured by sales per square feet, according to industry publication RetailSails. Last year, they outpaced Tiffany's (TIF) in that measure by 40%. But if Apple were to create a new vision for the Apple Store, it's not clear where that would come from. For now, the Apple Store is leaderless. Apple has yet to find a permanent replacement for Browett, who only lasted fewer than 10 months in the job. He replaced Ron Johnson, who is largely credited with developing Apple's retail strategy. Johnson left for J.C. Penney (JCP) in 2011 ... though he's currently available.